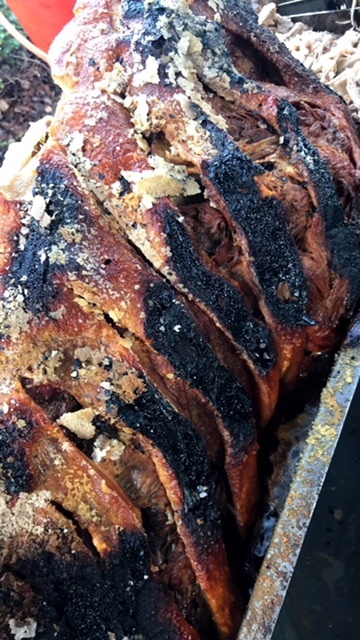 If you’ve been considering hiring a hog roast machine so you can DIY, whether as a professional chef for your customers or a domestic chef who wants to cook for family or friends, Hog Roast Ashton-under-Lyne is the answer to your rental prayers. We’ve spent many years hiring out our equipment to both seasoned chefs and newbie ones, both pro and home cooks, and we have a range of machines that we can rent to you depending on your needs. You may want to cook a small pig in your back garden for a handful of guests or at the other end of the scale, you may need more than one of our larger machines in order to cook for hundreds of guests at a wedding or corporate event; either way, we’ve got you covered. When Glen called Hog Roast Ashton-under-Lyne regarding a machine rental, it was for his work’s Christmas party. We’ve known Glen for years as the company he works for has used our catering services for various events in the past, but for this party, they decided on a DIY hog roast at the business premises. Glen told us he was in charge of both booking the rental and cooking the hog – for the first time ever. It’s understandable if you are nervous if you’ve never cooked this way before, as many people are, but we designed our own range of machines with ease in mind and they are also highly portable and manoeuvrable. When it comes to cooking with one, it’s as simple as setting the temperature and turning the machine on. We designed them to work like conventional ovens, so you can actually cook so much more than a hog or spit roast using one, so if you want to add potatoes and vegetables, for example, these can be cooked inside while the meat roasts away above. Hog Roast Ashton-under-Lyne delivered the machine to Glen’s work recently and our chef talked him through the process. Once he was comfortable, we left him to it, but left him with written instructions too. When our chef collected the machine the next day, Glen was proud to say everyone loved the hog roast that he cooked using our fantastic equipment, and they will be cooking their own again in the future too. Christmas Party Preparation – Hog Roast Coppull!